DXRacer Tank Series ▷ Size & Buying Guide on GOTURBACK.UK! As the name implies, the DXRacer Tank is a strong and sturdy product. The chair looks great too, combining strength with elegant style. The curving backrest design, the flashes of vibrant colour, and the sheer solid size of the chair – they stand over five-foot tall – make them look quite regal, almost like a throne. 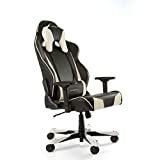 They are not going to be the cheapest gaming chairs on the market, but they offer gaming comfort to the user, even during those all-night marathons, and will add cachet to your games’ room – they will look fantastic standing in front of your gaming setup! The price should also be considered taken against the expected life-span of the chair: these chairs are very solid, carefully designed and engineered and built to last. The price should also be considered taken against the expected life-span of the chair: these chairs are very solid, carefully designed and engineered and built to last. The DXRacer Tank is fully adjustable, boasting the usual tilt and height adjustments, but also offering more personalised tweaks to ensure that the chair is exactly right for the user’s body shape and size – even the armrests are fully adjustable. Let us take an in-depth look at the specifications: these chairs weigh a hefty 30 kilograms (66 pounds) and stand up to 55 inches from the floor. The chair is a generous 27 inches in width. The five 3-inch wheels are made from durable polyurethane, and these are held in place by a strong aluminium base, which is picked out in the bright colour found elsewhere on the chair. As well as the usual up-and-down and back-and-forth tilt mechanisms, there is a large angle adjustor which can change from upright to almost a full recline if desired. Other features include lumbar support, a headrest and a choice of colours: red, blue, emerald and black. The Tank comes in two models: the TS29 and the TS30. The difference between the two is very subtle and basically comes down to the fabrics with which the chairs are upholstered. The TS29 is covered with polyurethane (PU) while the TS30 is covered with a fabric-style strong mesh. Whichever covering you choose, the seat and backrest are made from high density mould shaping foam to ensure maximum comfort at all times. As mentioned above, these chairs are big. They are designed to support even the biggest players, and boast an XXL tag. Bigger players sometimes find that their chairs start to chafe quite quickly, and to compress after many months of play. Another common problem is that the height and tilt adjustors become weak points, leading to the chair’s hydraulics or tilt mechanisms no longer work or become saggy or wobbly. The structural engineering that has gone into designing these chairs means that this is unlikely to happen; the name ‘Tank’ is an appropriate one! You will need plenty of space in your designated gaming area, the chair’s generous sizing means that it has a relatively hefty footprint. However, if you are a taller player who has always had to hunch to fit into regular-sized chairs, the DXRacer Tank may well revolutionise your gaming!